I am happy to announce a new member to the Team Nater family, 110 Play Harder! 110 Play Harder is a compression and recovery company that offers the very best in recovery products. With over 15 different compression products, 110 Play Harder offers something for whatever your compression needs are. Whether it is calf, knee, quad, full tight, half tight, forearm, or full arm compression, 110 Play Harder has you covered. So you might be asking, “Well what’s the difference from all the other compression companies?” I am glad you asked :) All of 110 Play Harder’s compression apparel is made with an outer pouch enabling you to easily slide in an ice pack! GENIUS!!! Ice and compression on the go! But, now you might be asking, “Well what if I don’t want to take an ice chest or find a freezer everywhere I go?” Good question. Whenever you buy one of the ice compatible sleeves, they are sent in a super nifty silver bag. This bag is thermo regulated, so once your ice packs are frozen, you can put them in your silver bag and they will stay frozen for up to 6 hours!!! For example, are you going to the gym for a few hours and want to ice after? No problem! Have a 4-hour flight and want to ice during your layover? Do it! Have multiple races or games in one day and need to cool your legs down in between? Go for it! This is what separates 110 Play Harder from all the other companies and when you use their products chances are they will set you apart from the rest as well. As I am training for the 2016 Olympics, every day counts. The simple fact is, the faster I recover, the faster I can get back to training my body at the best of it's ability. Let's say that typically I can recover day-to-day 90%. That’s not bad. But, what if by wearing 110 Play Harder compression and ice I can recover to 92%? That is 2% more I get out of every day of training. In an event where I can win or lose by .001 of a second, 2% is a huge deal. So, it is for this reason that I am thrilled to be using 110 Play Harder. Please give their website a visit to check out their products for yourself. If you have any questions about 110 Play Harder, recovery, or compression, feel free to comment below or shoot me a message. Juggler Knickers in full effect with ice packs! About seven months ago I was approached by Ero-Sports to see if I would be interested in learning the art of bike fit. After seeing several months of fits at the velodrome as I was riding I was very intrigued and responded with an immediate YES! At that point for the next five months all of my extra time went to apprenticing dozens of fits so I could truly learn by doing. Some things were easy from the get go and others not so much. It was a huge compliment when Jim Manton (Owner of Ero-Sports) said I have "The Eye" for bike fit being able to see where the body angles were, but more importantly where they needed to go to function most efficiently. So What is a bike fit and why is important for anyone riding a Road, TT, Tri, Mt, or Track bike? At Ero-Sports we use three things to get you in the most optimal riding position as possible. 1. Your feedback. 2. My trained eye. 3. The Retul measuring system. Using all three of these approaches is sort of like a checks and balance system for the bike fit. It makes sure that not only the biomechanical ranges that Retul gives us are right, but most importantly so that you the rider are pain free and comfortable on your bike. We like to say that "there is no such thing as normal pain on the bike." If you have foot, knee, hip, back, shoulder, or any other type of pain while riding there is a reason for it and it is my job to figure it out and fix it! When going through the bike fit process you first start on your own bike set up on a trainer. Once you have warmed up and I have taken a look at your posture on the bike and biomechanics I will "dot you up." I place 8 infrared sensors on different boney land marks that are seen by 4 cameras capturing 476 frames a second!!! As you pedal the cameras are capturing your riding position and biomechanical ranges. There are certain biomechanical ranges that 99.9% of people fall within. Throughout your fit it is my goal to not just get you into range, but most importantly using your feedback, wattage, and the Retul system find out where you function most optimally within the range. 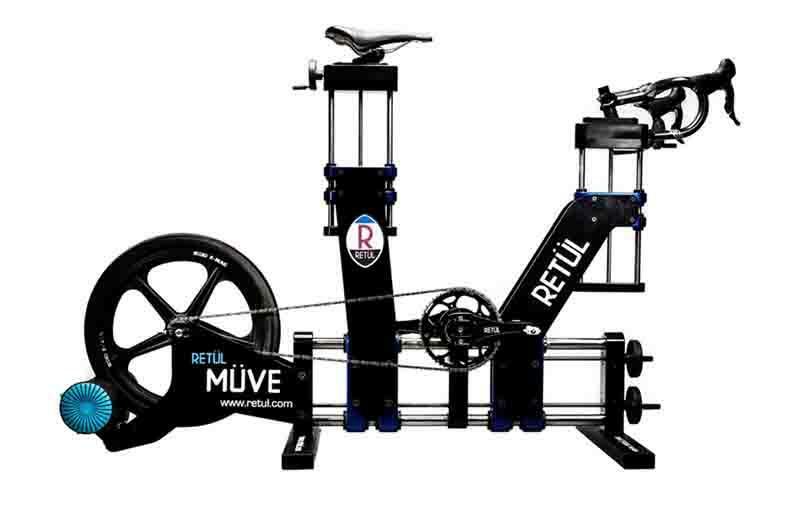 After I take the first capture we will make small changes to your bike as it is on the trainer or move you over the the Retul Muve fitting bike that enables us to make incredibly quick and efficient changes. Throughout the process we will go up, down, forward, and back several times not just to get you in the most optimal spot, but also I really want you to feel and learn your position so you feel confident in it and know why it is where it is! Once we have found your position it is time to measure your bike. Using the Retul Zin measuring wand we are able to measure your bike to the millimeter! These measurements then go online to ero-sports where you can print them off or see them at anytime no mater where you are. This is the end of your fit, but not the end of your fit process. When you leave the velodrome you do not stop being my client. You get 2 free follow ups to make sure you are dialed in, but if you need more that rule goes out the window until we both know you love your fit. As I am training for the 2016 Olympics this will be my main source of income. Being a bike fitter allows me to schedule making money around my busy 40hr a week training schedule and also allows me the convenience of working in the the same facility that I train. Since I do not recieve any support to train for the Olympics from USA Cycling it makes it very tough to pay bills and put food in my mouth, but now that I have this opportunity it will take the stress of financials down dramatically! SCHEDULE A FIT FOR YOUR OWN BENEFIT AND SUPPORT ME ON MY OLYMPIC JOURNEY! To schedule a fit with me go to ero-sports and click on the "schedule your appointment" link in the right hand corner. I am a U.S. National Champ! .....What does that mean? A week ago I became a U.S. Nation Champion! AWESOME, GREAT, FANTASTIC, but like so many people asked me this week, "what does it mean?" To put it pretty simply, it means I am a U.S. National Champion. It is a great title and one that I am very proud to have, but there are no immediate benefits (cash, cars, or houses) that come with it. As an athlete it means I am allowed to put stars and stripes on on all of my jerseys showing that I have the title. Also, for the next year I am allowed to wear a National Champion jersey anytime I race the Team Sprint. Pretty cool! The biggest thing that becoming National Champ does is solidifies my abilities within my discipline and provides lots of opportunity for sponsorship. Since I am not funded by USA Cycling I must rely on sponsors to help support me as I train 30-40 hours a week. Obviously with that kind of training schedule it is very unrealistic to hold a "normal" job so it makes paying bills and putting food in my stomach a difficult task. All of the sponsors I have as of now are product sponsors. Meaning they supply me with what they make (CNP Nutrition, Muscletracs, Zarzana Chiropractic) making it so I am not paying out of my own money for the product or service and in return I represent them in all aspects of my life. This is great because not only do I get to pick and choose who I represent as an athlete, but also I choose my sponsors knowing that I am getting the very best nutrition, clothing, equipment, and whatever else I need. Putting in the time and training hard is a big part of it, but it's the little things that all of my sponsors provide that bring it all together and make the big difference. As I continue to improve as an athlete and Team Nater (YOU) grows I hope to be able to attract a few larger sponsors with the ability to truly allow me to train full time without the worry and energy of how to make ends meet. Being able to have the financial side of things taken care of is the link from being good to great!